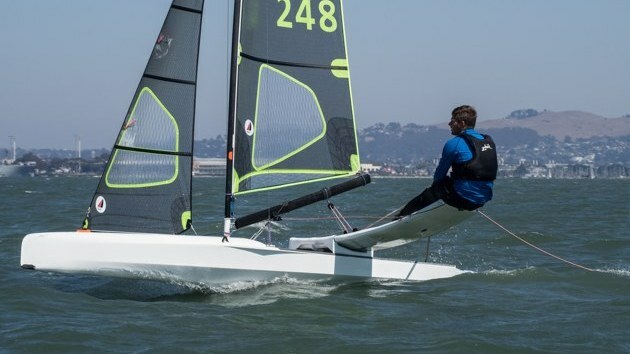 In conditions close to a dinghy racer's dream of heaven, Robin Wood from South Wales proved that a very, very good little one can indeed beat the big guys on their own patch, winning the International Canoe world championship, held by Richmond YC, California, in convincing style. 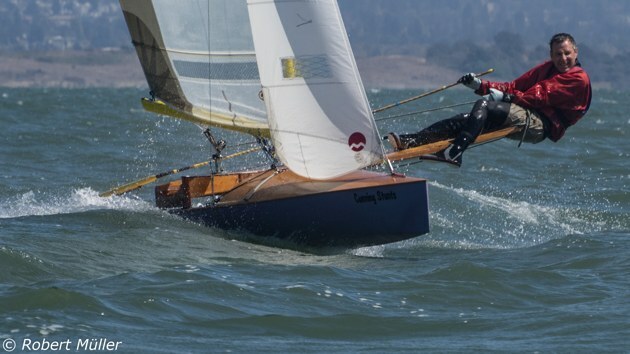 Other classes had told the British teams - an amazing 16 strong, thanks to transport and sponsorship from Chartham Papers - to expect strong winds, but no description can adequately convey the boat-busting muscle-wrenching reality of San Francisco Bay. The powerful thermal winds and big Pacific waves funnel through the Golden Gate and then hit Alcatraz and Angel Islands on the edge of the Continental Shelf. The water goes from over 100 ft to 20, and the big waves turn into a short series of near vertical square waves which feel like brick walls when the tired body catapults through them at 16 knots or more, clinging desperately to the end of a five foot sliding plank. Wood opened his attack on the title with two positive wins over Steve Clark of the USA, multiple and previous world champion. Surprisingly, Wood, at around 170lb was giving Clark over 30lbs and some five inches in height, but consistently held him upwind and then vanished down the reach. 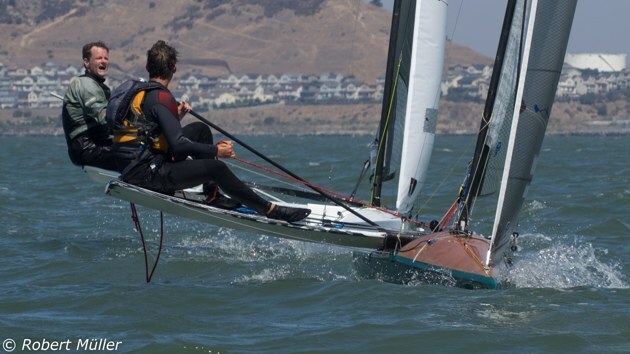 On the third day two races were scheduled back-to-back, but despite the sunshine and sparkling water, expressions were grim as the fleet of expert boat rebuilders put to sea. 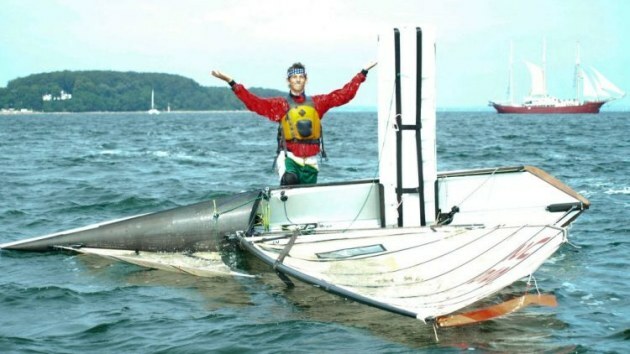 Current North American Canoe champion, Lars Guck, started a controversy by appearing with a large sailmaker�s advertisement right across his mainsail, and proceeded to endorse the product with a handsome win, front running all the way with Wood digging his way out of an indifferent start for a sound second. As the day wore on the thermal wind build-up really hit its stride. �Midst breakages galore, and lesser mortals crawling whimpering into the shore, most of the fleet went for a very wild ride. Big Steve Clark came into his own with Guck and another hefty lad from the USA, Erich Chase, showing the rest of the world how it is done. Wood described his experience as a pitchpole followed by three eskimo rolls, and calmly retired to be rested for the next outing. The fifth race was just a little easier on boats and men but still the wind and current bends left no room for tactics. Boat speed was the deciding factor and Guck and Wood had it, with Clark and Chase chasing hard. By now it was obvious that the championship lay between three men and the sixth race would be a clincher. Friday dawned grey and colder but still the ocean breeze was solid and the thermal build-up would come around an hour from the noon start. Clark turned the tables by triumphing in a lesser wind - against all the laws of gravity - with Wood and Guck breathing down his neck. As the leaders ran home in 18 knots of wind and a lumpy sea the poor old tailenders battled into 25 knots and sat exhausted head to wind at the finish line composing their wills and regretting their sins before the big bear away decision. Into the last race with one point in it and the British team and supporters squinted into the sun and spray as the first boat hurtled past the windward mark. Was it bright red? YAY it was and so was the second one! What was this? It was Mike Fenwick, the quiet man from Weymouth, determined to show there was more where Wood comes from. Then came Clark and Guck, grimly competent, but Fenwick held the bridge while Wood stormed away, bolt upright and steady as a rock as the fleet rocked, rolled and swam in his wake. 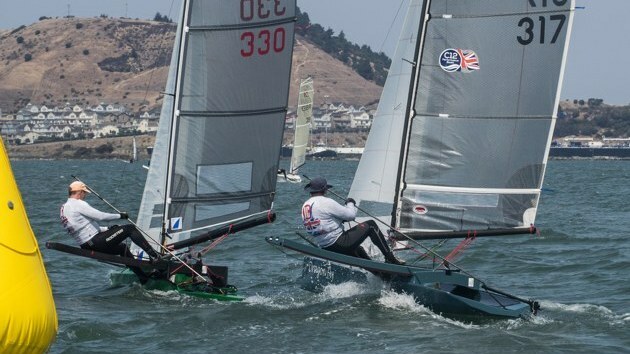 With a superhuman effort Guck edged Fenwick out by some three inches on the line for a good second but it was not enough - the gold medal was on its way to Newport, Wales, not Rhode Island, and the wonderful, sunny, windy boat building competition was over. Every competitor was wearing a huge silly grin by the end and words cannot express the gratitude to Richmond YC. �Boffo - a good one� will have to suffice. We had been promised brisk winds, and we were not disappointed. As soon as the container was unpacked alter its six week voyage via the Panama canal the British were out on a shakedown sail to get the flavour of the water. Out of the Golden gate they found huge breaking seas where the powerful Pacific rollers funnel through and as the depth of water shallows from over 100ft to less than 20ft in the comparatively sheltered "Olympic Circle" turn into a series of short waves, just the length of a canoe with foaming white tops and near vertical walls. The water is cold and this usually causes a mist to form over the bay which the sun burns off by noon - the scheduled start time for racing. The hot sun on the land coupled with cold water produces fierce thermals with winds over 25knots in the afternoon. West coast hero Eric Chase led the fleet around the practice race and convinced the locals that the Championship was in the bag. They had not noticed that the real contenders for the title stayed ashore. 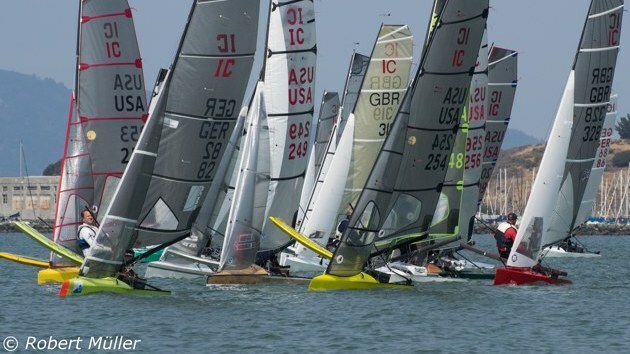 With the preliminaries of checking measurements, the raising of flags and the opening ceremony by ICF president Sergio Orsi completed, the championship racing started on Sunday 8th August. Robin Wood was soon out front and took first place ahead of Americans Steve Clark and Lars Guck. 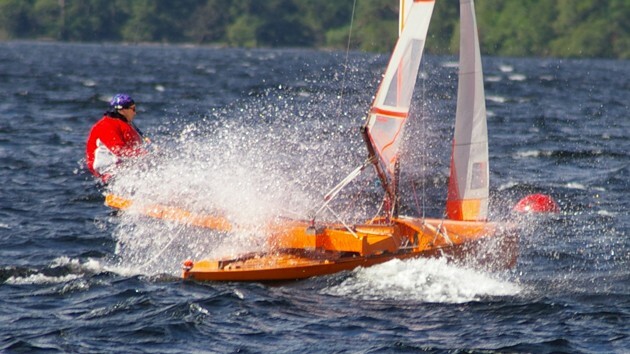 On Monday Robin repeated his performance, finishing over 1 minute ahead of Steve Clark and with the wind rising to well over 30knots the ebb tide against it created an even more ferocious sea. Tuesday was the toughest day with two races "back to back". bright sun and sparkling water there may have been, but the testing conditions were not to be disguised. Lars Guck soon went ahead for an easy (or easy looking) victory while Robin Wood pulled up from a poor start to finish second. Race 4, with the full force of the sea breeze, gave a wild ride to competitors already tired after the morning's contest. 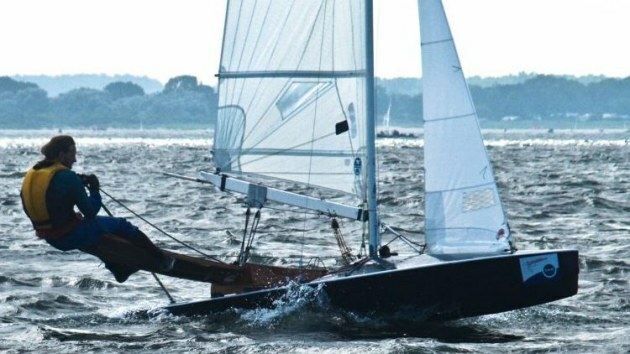 Robin Wood was swept overboard at the start of the reaching leg, turned turtle in the shallow water with the top of the sail embedded in the mud. That was his discard written off! After this came the rest day - the British contingent were encouraged by the announcement that, as had been agreed in advance, on the basis of the results of the first 4 races a British team would have the honour to challenge the Americans for the New York Canoe Club International Cup. As for the rest day, it was occupied by frenzied repairs, nursing of wounds or sightseeing according to individual preferences. Racing resumed with race 5 on Thursday. The wind had eased just a little and with mostly slack water the sea a little less fierce. Lars Guck quickly broke through to a comfortable lead and the race became a procession - Lars Guck, Robin Wood and Steve Clark. Friday and race 6. The sun failed to break through the mist and low cloud and with the hills a little greener and the cool air a little moister one could imagine oneself sailing off the Scottish Coast or, maybe, the Welsh coast. Either way it inspired Robin Wood enough to maintain his second place while Steve Clark, albeit the heavier man, in these conditions went on to take the honours. Race 7. With Robin Wood, Steve Clark and Lars Guck all so close on points all now depended on the last race - but with extra pressure on Robin as he had already blown his discard. As the canoes came up to the weather mark there was the familiar sight of Robin Wood out in front, but followed, not by one of the Americans but by a British Canoe - Michael Fenwick sailing his best race of the series. He held his position until the very last tack to the finish when Lars Guck squeezed past to take second place by inches. So a memorable championship finished, strong winds and wild seas to the end.